A United Launch Alliance Atlas V rocket blasts off from Space Launch Complex-41 at 12:25 p.m. EDT with the Juno spacecraft for NASA. The launch of the Juno mission marks the second of five NASA missions scheduled to launch this year on ULA vehicles within a six month timeframe. Juno will improve our understanding of our solar system’s beginnings by revealing the origin and evolution of Jupiter. After a five-year journey, Juno will spend a year and 33 orbits studying many scientific aspects of the largest planet in our solar system. The vast team of scientists and engineers responsible for launching NASA's new Juno spacecraft to Jupiter today (Aug. 5) can finally breathe a sigh of relief after a successful liftoff, but now comes the long, five-year wait for the probe to actually reach the gas giant. NASA's Juno mission began with a blast this afternoon at 12:25 p.m. EDT (1625 GMT) when Juno lifted off on an unmanned Atlas 5 rocket from Florida's Cape Canaveral Air Force Station. The rocket, though delayed by a technical glitch and a wayward boat too near the launch pad, eventually soared spaceward in a "phenomenal" launch, in the words of Jan Chodas, Juno project manager at NASA's Jet Propulsion Laboratory in Pasadena, Calif. Other team members were equally thrilled. "I can't be happier," Scott Bolton, Juno's principal investigator from the Southwest Research Institute in San Antonio, Tex., said in a news briefing after the liftoff. "It's just a dream come true." Juno is not slated to arrive at the solar system's largest planet until 2016, though the scientists will have plenty to occupy themselves during the wait. "It's not five years of boredom, that's for sure," Chodas said. "At first what we'll do is monitor the spacecraft around the clock. It's a brand new baby. We want to learn and understand its quirks and idiosyncrasies." 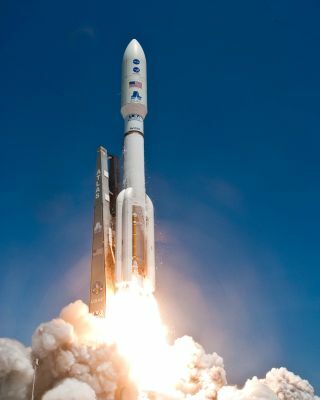 And in 2013 Juno is slated to make a flyby of Earth, using our own planet's gravity to slingshot itself toward Jupiter. "Right now we plan to operate most of the instruments at the earth [flyby]," Bolton said. "You learn about the spacecraft long before you get to the outer planet that you're going to." Eventually Juno will take up a year-long polar orbit around Jupiter to study in detail the planet's magnetic and radiation fields with the goal of understanding how Jupiter formed. "It's really giving us insight into the very earliest times of our solar system formation, right after the sun formed to the beginning of the first planet," Bolton said. The Juno launch comes less than a month after NASA's final space shuttle landed, ending the 30-year shuttle program. NASA went to extra lengths publicizing Juno's liftoff in hopes of raising awareness that space exploration is continuing beyond the shuttle retirement. Those efforts included an official Tweetup NASA held for 150 of its Twitter followers to watch the launch in person, and a more general campaign that ultimately brought 10,000 people to view the liftoff from Florida's Space Coast, said Jim Adams, deputy director of planetary science at NASA. "We're extremely excited about coupling the energy the nation has about human spaceflight into understanding what we're doing with science," Adams said. And the excitement isn't ending yet. Adams highlighted two more high-profile planetary science missions also set to launch this year. NASA will loft the Grail spacecraft on a moon-mapping mission Sept. 8, while the agency's huge Curiosity Mars rover, also known as the Mars Science Laboratory (MSL), will launch toward the Red Planet in November. "Stick around — it's going to be a great year," Adams said. "We've got Grail and MSL coming up, and it's going to be fantastic."